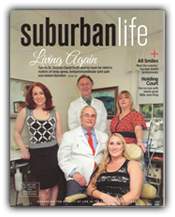 Dr. Stephen Smith and Staff are experienced in providing quality dental health care in a highly personalized, caring, and gentle manner. Immediate patient priorities are first assessed: pain control, emergency dental needs, frank decay, acute periodontal and soft tissue lesions, and bony or impaction problems. A major emphasis of the practice deals with headache and referred neck/ear/jaw pain associated with TMJ/ TMD temporomandibular joint disorders, and related muscle/myofascial dysfunction. Design and fabrication of special bite splints, nightguards, protective mouthguards, TMJ appliances, and anti-snoring devices. Multiple physical medicine modalities for pain control and jaw motion rehabilitation. What is TMJ or TMD and what are its symptoms? Headache and orofacial pain are often complex, involving both local areas and other regions of the musculoskeletal system of the body. Thus, a thorough history and comprehensive clinical examination are done at the first visit. At chairside, clinical evaluation and charting involves the structures inside the mouth and outside. Palpation of the Temporomandibular joints, muscles of mastication, and entire head/ neck region is critical in assessing orofacial/TMJ related pain and headache. Range of Motion of the jaw in all dimensions is measured, correlated to stethescopic sounds. The movement of opening and closing should be smooth without jarring or deflection. Lateral side to side and forward motion should be unstrained. When there is restriction and locking/popping of the joint, the existing closed position of the mandible and the fit of the teeth are manually compared to other potential jaw positions. This is done to test for differences in TMJ disk/joint function im-provement. Normal opening of 50 mm is seen here, without deviation to the side or joint noise. Besides palpation assessment, other procedures may involve measurement of muscle dysfunction and contraction/spasm via an EMG, or electromyogram, to the head, neck and jaw region. Tightness produces contraction and muscle referred pain.After a thorough diagnostic workup, and case assessment/plan discussion, a conservative course of treatment is usually recommended. This may typically involve an initial pharmacologic approach to acute pain and physical medicine modalities, such as moistheat/ hydrocollator pack , cold/vapocoolant spray & stretch, EGS electrogalvanic stimulation, TENS transcutaneous electrical stimulation and ultrasound. The use of light wave monochromatic Infrared energy for wound healing has been well established over the past 40 years. Both visible and infrared light have been shown to effect at least 24 different positive changes at the cellular level. With absorption of therapeutic light waves, unique therapeutic effects in tissue occur via photobiochemical reactions. Indeed vision, photosynthesis, tanning, and vitamin D metabolism are responses to wave-length dependent light reactions. Increase of vascularity with new capillary formation, stimulation of collagen production for damaged tissue repair, release of ADP for cellular metabolism/energy, increase of lymphatic system activity, with increase of lymphatic vessel size and flow for edema/swelling reduction. Increases RNA and DNA synthesis, reduction of excitability of nerve tissue, pain relief, stimulation of fibroblastic activity to aid repair, increased phagocytosis in blood cell "cleanup"/ scavenging activity, critical in infection control. Thermal effect, without cellular heat from the diodes; stimulation of granulation and connective tissue for ulcer and wound healing, with acetylcholine release and parasympathetic effects. There has been recent development for Orofacial region/TMJ pain , with new infrared treatment modality delivery. 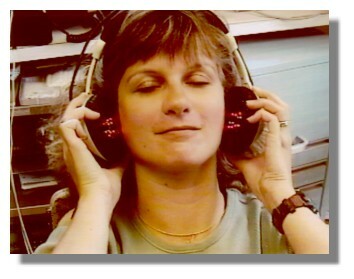 The applicability to the jaw/TMJ region and cervical is done through two hand pieces mounted inside the medical device, which looks like stereo headphones; this houses the multiple light emitting phototherapy/low energy laser diodes. Treatment of joints and deep muscle is approached directly, with each side is treated as a unit. With the headphone-like dual assembly infrared system, there is delivery of bilateral side-to-side therapy. Manipulation/mobilization procedures to jaw and neck region, trigger point injections, home care exercises and postural stress/tension reduction are also utilized to help with long-range stabilization. These are often integrated with an initial in-traoral daytime orthosis/ soft mouthguard and then a nightguard. Splint Appliances: A hard laboratory processed splint is usually prescribed for longer term use, 24 hours a day in acute situations. The goal is to reduce pressure on the joint to get it to settle down (decompression). A Full arch maxillary splint appliance is seen here, with functional overlay occlusion/bite for chewing. 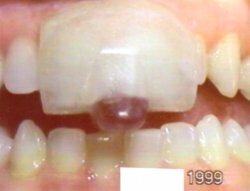 Biting surfaces help guide jaw downward and forward to reduce and reposture disk of TMJ. Anterior coverage is clear for daytime esthetics. Same principles of design for mandibular splint apply. For night time only, a "pull forward ramp" may be added, with breathing holes. Arch bar and clasping provide for additional retention; a flat-planed design for primary muscle/clenching type pain may be elected. Return visits require further bite/appliance adjustments, coupled with therapy. Long-range plans may call for other dental rehabilitation, orthodontic, and prosthodontic considerations. Referral may be made for an MRI or magnetic resonance image of the joint, where potential surgery is anticipated for dislocation or chronic displacement. Maintenance/return visits with continued therapy and splint/niteguard use help prevent relapses. A very successful new night appliance is the NTI TM clenching suppression system. Patients with aching jaws, morning headache, sore, sensitive teeth, neck stiffness, TMJ pain, and tension headache often unknowingly clench their teeth at night. The NTI device prevents the temporalis and masseter muscles from forcefully contracting utilizing the jaw opening reflex. This allows the appliance to protect incisors, posterior molars, surrounding tissues and TM joints, and helps prevent associated headaches of muscle contraction. The system and its patents have been FDA approved for headache and TMJ therapy, and is a recommended procedure for migraine head pain treatment by many international headache centers/clinics using a medical/dental team approach. The appliance design is to reduce muscle contraction headache, with excessive masticatory myalgia and muscle hypertonicity relaxation, focusing on the masseters and temporalis. The appliance helps reduce the net effect of clenching and tooth grinding stress and wear on the teeth and occlusion. 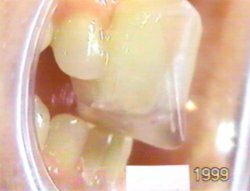 Contact is anterior at the incisor region, with the cuspid, bicuspid, and molars out of contact upon closure. The incisal region features a smoothe functional sliding ramp to accommodate multiple jaw positions at night. Mintiva TMJ is a new topical treatment for TMJ pain, featuring a proprietary deliver system that absorbs quickly, effectively relieves pain, and allows greater range of motion of the jaw. TMintiva is an over -the- counter topical cream, developed to dental professionals' specifications to target and relieve temporomandibular joint pain. It is non-greasy, fast acting, and does not leave a medicinal smell like some topical treatments.Other Mintiva formulations can also relieve arthritic neck and back joint pain. The cream is applied to the TMJ, jaw muscles, massaged into the skin. For further information and ordering, click on the following link, using coupon discount code #1003: www.mintiva.com.